I hope you guys had a great Thanksgiving! I'm still stuffed (and yet I keep going back for more leftovers). Black Friday has finally arrived and I've got a gift for you. After all the shopping, rest your feet and relax with a book. It's free. 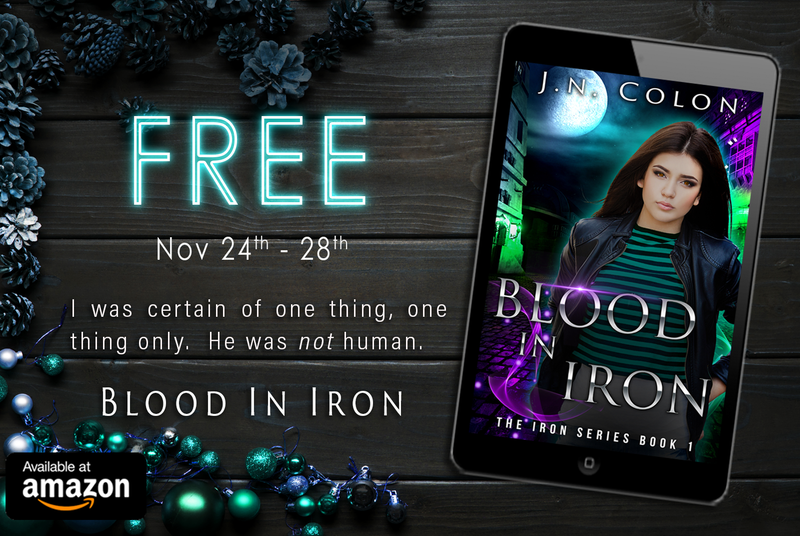 Blood In Iron, the first book in The Iron Series, is FREE Black Friday through November 28th. If you haven't started the series, now's the time! When the rebellious teen discovers demons roam her city and she was born to hunt them, Kory’s life and all she’s ever known is irrevocably shattered. She’s caught between simply surviving and following the path she was destined for. Rex, the powerful demon hunter, becomes her teacher and the chemistry between them is both undeniable and forbidden. Relationships and loyalties are tested and, as Kory falls deeper into this new supernatural world, dark secrets arise, hinting that her destiny may be more than she bargained for. Is she simply another demon hunter or is her blood the key to something darker?